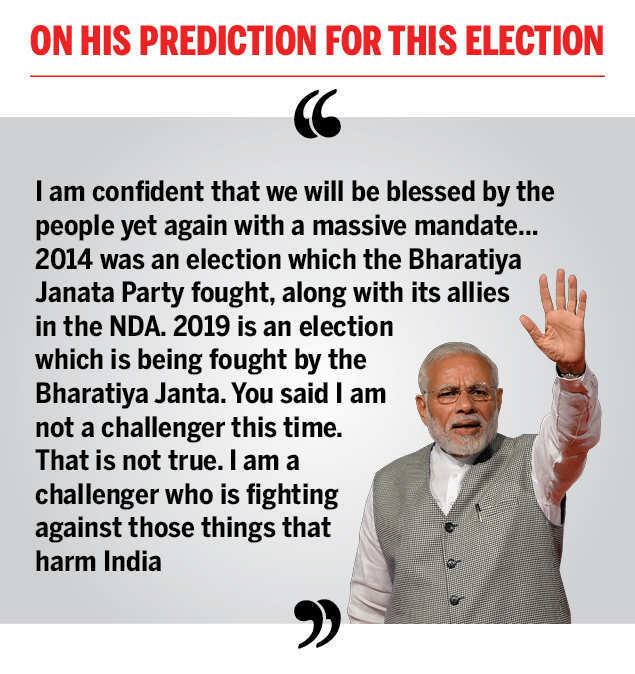 TOI: How do you rate BJP’s election prospects? Unlike in 2014, you are the incumbent in this election, not the challenger. PM: I’m confident that we will be blessed by the people yet again with a massive mandate, with more seats than before. A stronger government than before. In all the states that I’ve visited, I’m seeing unprecedented support. The first phase of polling and the people’s response have reinforced my confidence. 2014 was an election which the Bharatiya Janata Party fought, along with its allies in the NDA. 2019 is an election which is being fought by the Bharatiya Janta. You said I am not a challenger this time. That is not true. I am a challenger who is fighting against those things that harm India. Corruption weakens our country from within, I am challenging it. Dynasty politics weakens our democracy, I am challenging it. Terror threatens our nation’s very existence, I am challenging it. ‘ Chalta Hai’ attitude held our nation’s progress hostage for a long time, I am challenging it. Forces of negativity try to obstruct an aspirational India from rising, I am challenging them. The people of India too are challengers. Along with us, they too, are fighting parties like Congress that want to take India back to the era of corruption and loot. There is such a mood against the Congress that, by their own admission, they are fighting on the lowest number of seats in a Lok Sabha election ever! People can see very well that Congress has no neta, no niyat, and no numbers either. Anyone who sees Congress’s campaign or manifesto can easily understand that they’re not fighting the election to win. They have no vision for the country. What they are doing is akin to adding drops of lime in milk and the outcome is always disastrous. Less said about the Congress’s equally opportunistic ‘allies’, the better. At press conferences they are all together, but in the polls, they are not. The people can see through all these parties. 2014 was a mandate for hope and aspiration, 2019 is about confidence and acceleration. 2014 was about some immediate needs the country had, 2019 is about what India wants! We have empowered aspirations and facilitated the innate appetite for upward mobility that is in our people. We took obstacles out of the people’s path and instead, enabled them. Now, the people themselves are powering us into a greater upward growth trajectory. In 2014, UP formed the cornerstone of your election victory and of BJP getting a majority. 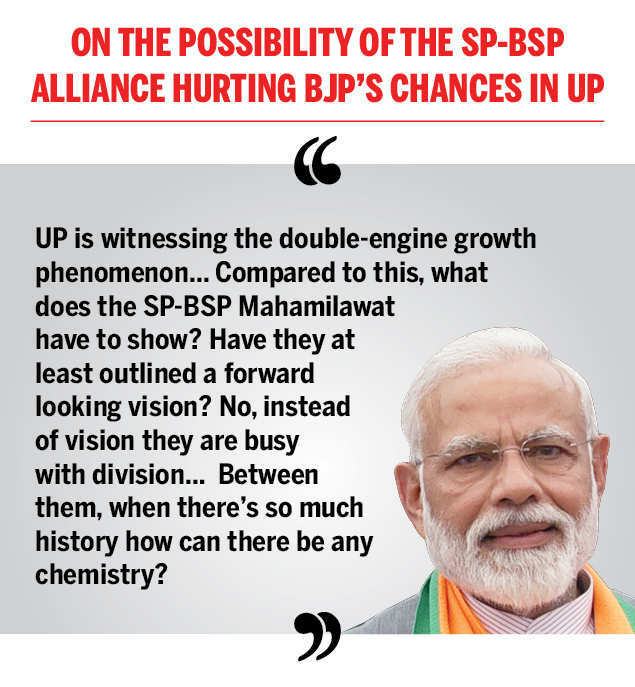 Do you think BJP’s numbers will be affected by the BSP-SP alliance? Take a look at the analyses of the past few elections. Same questions, same political pundits, same air-conditioned offices and studios and yet when it comes to ground reality…often off the mark. In 2007, when I was fighting elections in Gujarat, people analysed results of some 40-50 municipal elections. Anyone who came from Delhi would say that you did not do well in the municipal elections and you are losing. I would explain that in Gujarat, elections to municipalities traditionally saw independents contesting. Congress never contested on its symbol. We were the exception who contested on our symbol. This did not mean that where we did not have a candidate on our symbol, we did not have an independent. I am commenting on your information and assumptions. The same questions were asked during the UP elections (in 2017). The same headlines were written, when these two boys (Akhilesh Yadav and Rahul Gandhi) wearing black jackets got together…. This is what I would read in newspapers, Congress and SP alliance will overwhelm BJP. What was the result? I don’t think that people of UP will forget all that happened in the past and change their opinion in two years. I think any such analysis must take into account the intelligence of the people. People’s ability to understand the arithmetic and the logic behind the coming together of the Mahamilawat (great contamination) parties should never be underestimated. People know exactly why they are coming together, no matter how much these parties themselves try to mislead. There was a time when many different parties did come together to fight an election. This was the Emergency era when survival of our democracy was first priority. So, when many parties united, there was a clear issue that brought them together in national interest and people blessed them. What is the uniting factor for the Mahamilawat now? Personal survival and personal interest. People are aware of this and will reject such opportunism. UP is witnessing the double-engine growth phenomenon. Both the Centre and state governments have worked in tandem to transform lives. From investment to law and order to our work on Ganga, people have witnessed how a transformation is occurring in UP. The central government’s schemes have empowered people, be it through crores of gas connections, bank accounts through Jan Dhan, electrification, Ayushman Bharat or affordable homes. Compared to this, what does the SPBSP Mahamilawat have to show? Have they at least outlined a forward-looking vision? No. Instead of vision they are busy with division. SP has repeatedly accused BSP of loot and corruption. BSP has repeatedly accused SP of goondaism and bad governance. I say that both are right about each other. Between them, when there’s so much history how can there be any chemistry? UP will vote for vision and not division. UP will vote for opportunities and not opportunism. UP will vote for development and not dynasty. UP will vote for those who put India First, not those who put Family First. What is the core narrative of your campaign? While you have often spoken of development, national security has emerged as a strong theme. But critics and opposition say BJP is resorting to ‘hyper-nationalism’ instead of focusing on ‘real’ issues. Our vision, mission and agenda is clear: Development for All. You can check any speech of mine. A large portion of it is dedicated to issues of development. However, it never makes headlines. Talking about real issues, can we consider decades of terrorism and deaths of our soldiers as not being a ‘real issue’? Those who did absolutely nothing on the critical issue of national security are now having problems when India’s national security doctrine has seen a strategic shift. Politicisation of the army happened when they created a fake news of revolt by the army to gain sympathy. It happened when credit for victory in the 1971 war was given to Indira ji. I am surprised why our neutral media was silent then! It was deshbhakti which inspired Gandhi ji’s freedom struggle. It is deshbhakti which is powering the Swachh Bharat Abhiyan. It is deshbhakti which is powering the movement to ensure smoke-free lives to women. It is deshbhakti which is powering the movement to give houses to all the poor in India. It is deshbhakti which is powering the movement to provide electricity to all homes. Deshbhakti is not a disease. Just as hyper-secularism was invented to strike at the root of India’s culture and ethos, similarly the terminology of hyper nationalism has been invented to portraydeshbhakti in poor light. Are the elections also a choice between ideologies, a vision of what the country should be? Congress kept saying that it is a fight about ideology. But they never came (out) with any ideology. They left the maidan open for us. The people want a strong nation. They want a country that is developing at a fast pace. BJP’s track record of five years is only and only about development. Do you feel any pressure? I feel a sense of responsibility. 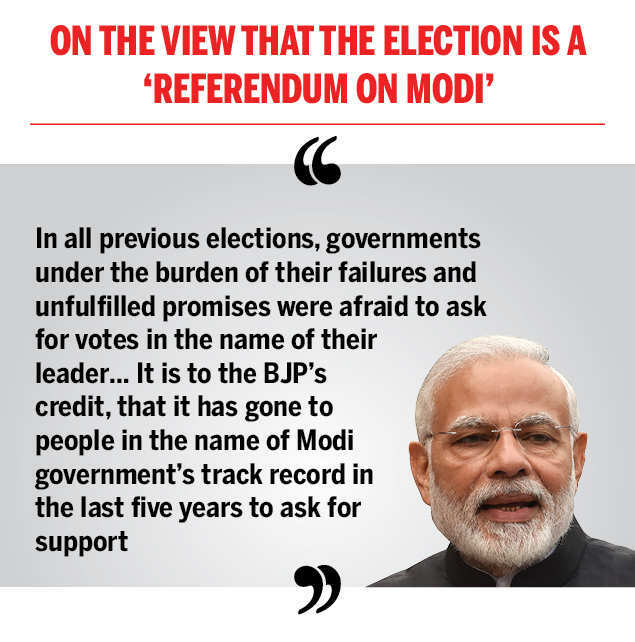 Political pundits say this election is a “referendum on Modi”. We cannot remember an election when one person has dominated the discussion as much as you have. Both your party and the opposition have made you the central figure in their campaigns — for, and against. If someone is at the centre of these elections, it is 130 crore people of India. This election is not about one individual, but about hopes, expectations and aspirations of 130 crore individuals. People of India have seen obstacles of past 55 years and they have seen optimism of our 55 months. They have seen 55 years of Family First and 55 months of India First. In all previous elections, governments under the burden of their failures and unfulfilled promises, were afraid to ask for votes in the name of their leader. As a result, they would change the track to divert elections with some other issues. Friends in the media know that in 2014, the UPA even asked then-PM Manmohan Singh to desist from campaigning. It is to BJP’s credit, that it has gone to the people in the name of Modi government’s track record in the last 5 years. It is to BJP’s credit that unlike the previous government, the party is not afraid to ask for votes in the name of its leader. You should be happy that there is a party which is fighting on the basis of its work. The opposition has no guts to contest us on issues. People have seen the difference of our India First government and have got various benefits. That is why, on advice of their foreign strategists, Congress is just resorting to lies and slander. But because their sole focus is on attacking me, Modi has become a big issue. So, in a way, credit (for that) goes to the opposition. India’s ranking on Ease of Doing Business has risen dramatically, from 142 in 2014 to 77 now. And landmark reforms such as Insolvency and Bankruptcy Code (IBC) and GST have improved tax compliance. But red tape and regulatory bottlenecks still persist, and this leaves room for corruption. How do you plan to make the system truly corruption-free and citizen-friendly? I am very surprised to see The Times of India acknowledge an achievement of our government in at least one half of the question. It would have been good if you had written now and then about our reforms and achievements, their impact, and informed people about it. Anyway, better late than never. I am thankful to you for recognising our work. Our motto, as I have said earlier, is to remove red tape and replace it with red carpet. The dramatic rise in Ease of Doing Business rankings is evidence of our vision being translated to action. Reforms such as online application and processing, single-window clearances that remove the need to visit government offices often, speeding up of approvals, reduction of turnaround time across various domains. Even the number of procedures and documents needed to get the work done has been reduced remarkably. When government exists to empower people rather than to put obstacles in their path, progress is possible. We have striven to give a corruption-free and citizen-centric government. There are many measures taken to speed up work. For example, the decentralisation of decision making in railways. This puts greater power in managers to take decisions. Earlier, they had to await the approvals of GMs or the Railway Board. We have institutionalised honesty and transparency across the system. Direct benefit transfers have taken middlemen and leakages out of the equation and put benefits directly in the hands of the people. Over Rs 1 lakh crore of the nation’s money has been saved from falling into the wrong hands. Government e-marketplace has ensured a level playing field for all kinds of traders in servicing the government’s requirements. Procurement within the government is now transparent, it benefits MSMEs and saves money. The previous financial year saw a four-fold increase in total value of transactions on the portal and doubling of number of sellers in the marketplace. Abolition of interviews for certain government jobs has ensured that avenues for corruption and nepotism are cut down while merit is respected. Allocation of coal and spectrum both witnessed massive scams under the previous government. We auctioned those in a transparent manner and ensured immense gains for the nation. Getting passports, which used to take months earlier, is done within a couple of days. IT refunds arrive within days. Self-attestation is the norm now. As the true impact of many of our reforms begins to show, a virtuous cycle is kicking in helping growth and, in turn, enabling more reform. In fact, you are speaking of ease of doing business while we have already moved onto ensuring ease of living for the people. Changing work culture in government has been a huge challenge for a very long time. Do you think you have been able to make a significant difference? What more needs to be done? Not only change in work culture, but also destroying Congress culture was a key challenge. Learning new things is easy but unlearning (old habits) is a tough thing. Here people had to unlearn practices that Congress left behind and unlearning practices of 70 years was a tough thing. But I can say with confidence that we have succeeded in removing Congress culture from our system. When I talk about Congress culture I refer to policy paralysis, corruption, nepotism, presence of middlemen, departments working in silos, projects being delayed, etc. In the last five years the nation has seen how an efficient and non-corrupt government works. Take, for instance, the Pragati Session. Through technology we addressed many delayed projects. Except red-tapism, nothing else was keeping them grounded. We changed that. The A-Sat test… our scientists had the skill and capability to test but UPA, for reasons best known to them, never gave the permission. For MSME sector, loans up to a crore are now given in 59 minutes to the common man. Congress culture was telephone banking where their friends only got loans. Environmental clearances were cash clearance tools for Congress. They took 600 days and even then things were not proper. The period for environmental clearance have now come down to 150-180 days. These are just some examples. Lot of change has come and after May 23, when the NDA Government once again takes office, we will bring about more citizen-friendly measures. Some initiatives like Make In India do not seem to have yielded the desired results. Do you think a change of approach is required? Or do they just need more time and attention? I do not agree with your assumption that Make In India has not yielded desired results, when in fact, India has crossed several milestones to become a major manufacturing hub of the world. Do you remember the number of mobile manufacturing units in the country in 2014? 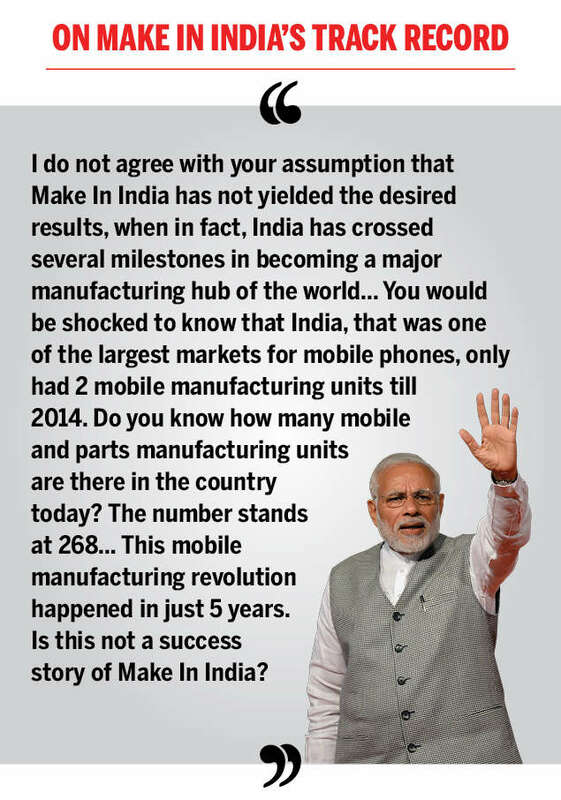 You would be shocked to know that India only had only 2 mobile manufacturing units till 2014. Do you know how many mobile and parts manufacturing units are there today? The number stands at 268. Not only that, India is now known to have the world’s biggest mobile manufacturing unit! This mobile manufacturing revolution happened in just five years. Is this not a success story of Make In India? Earlier this year, we witnessed the first-ever diesel-to-electric converted locomotive made in Varanasi. This is something that the whole world recognised with awe. Coaches for some of the world’s metro projects are being made in India. India’s first semi-high-speed train, ‘Vande Bharat Express’, is a result of Make In India. India’s defence manufacturing sector has got a new lease of life with greater impetus on Make In India. Our armed forces, who were made to wait for years for bullet-proof jackets, finally procured the jackets. It was not from a foreign manufacturer, but from our own facility. Of the total contracts signed, more than half have been signed with Indian manufacturers for procurement of defence equipment for the armed forces. It includes helicopters, radar, ballistic helmets, artillery guns, ammunition. The assault rifles that the world uses will now be made in a factory set up in Amethi. Now, the Naamdar can actually read ‘Made in Amethi’ on AK-47s. Do you think it was possible if Make In India was not working? Japanese companies, famous for their engineering capabilities, are now making cars in India and then exporting to their own country. When we came to office in 2014, India was attracting around $35 billion FDI. That number has almost doubled in the last five years. The world is lining up to invest in us, in our people, in our businesses. Because India today means opportunity. It means security for the world to park their investments. This is the kind of confidence our Make In India vision has achieved in just five years. There is a view that demonetisation and GST have hurt employment and investor confidence. (a) Do you think the implementation of GST could have been better to avoid some of the hardship and confusion people encountered? (b) What are the big measures the government can take to promote jobs and investment? This same narrative was being used during Vajpayee ji’s time when Indian economy was doing well. Demonetisation and GST were big structural resets in the economy. When changes of this magnitude occur, a temporary blip in growth is natural. Do you know that after the 1991 reforms, when Manmohan Singh was the finance minister, GDP growth rate came down to around 2%? Look at the evolution of GST. We continuously took into account the views of people as well as various sections of society and strove to improve the processes as well as the tax structure. Coming to the issue of jobs and investment, our target is to make India a $5 trillion economy. India is already one of the highest FDI attracting destinations, we aim to take it even higher. Our target is to bring India within the top 50 in World Bank’s Ease of Doing Business rankings. We have a plan to invest Rs 100 lakh crore in infrastructure in the next five years. We will create new opportunities of employment by providing support to 22 major champion sectors identified as main drivers of the Indian economy. We will also harness entrepreneurship to act as a force multiplier for job creation. We will give a boost to MSMEs and traders through special measures. 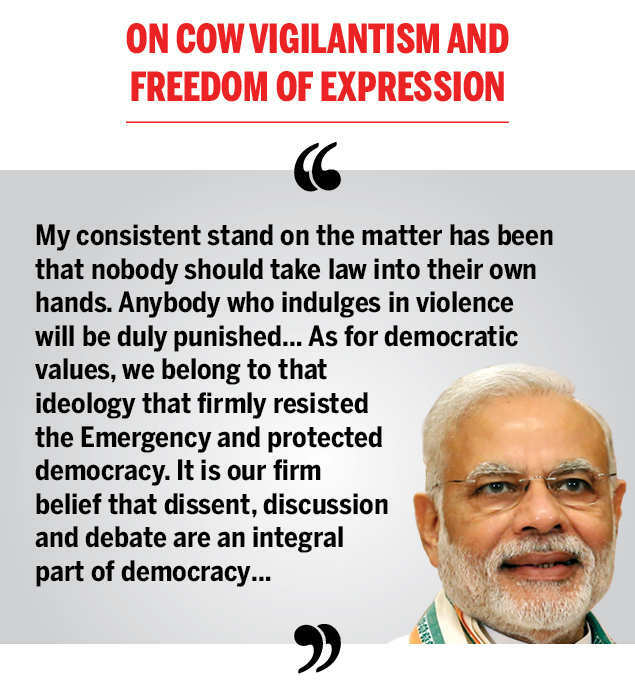 A charge that has been levelled against BJP is that causes such as cow protection have led to intolerance and encouraged cow vigilantes to take the law into their own hands. It is also alleged that freedom of expression and cultural rights have been sought to be curbed. There were protests like award wapsi and, recently, a group of artistes from the world of cinema and theatre issued an appeal to oppose BJP. My consistent stand on the matter has been that nobody should take the law into their own hands. Anybody who indulges in violence will be duly punished. As for democratic values, we belong to that ideology that firmly resisted the emergency and protected democracy. It is our firm belief that dissent, discussion and debate are an integral part of democracy. As far as award wapsi and letters of appeal are concerned, there are various organisations driving these campaigns. Many of the organisations have their operations here but funding sources abroad. They thrived in India but were backed by foreign funding. These organisations were well connected, well networked with the previous governments and were allowed to continue their anti-national activities. This happened despite the presence of a law, FCRA, that governs such organisations. But there was very little scrutiny and this law was not implemented in letter and spirit. When we came in, we implemented this law meticulously and asked these organisations to provide information about funding and accounts of foreign money. When accounts were sought, 20,000 such foreign-funded organisations stopped their activities. Now, these organisations and Congress are working in tandem, trying to misguide people to spread falsehoods against us and our government. 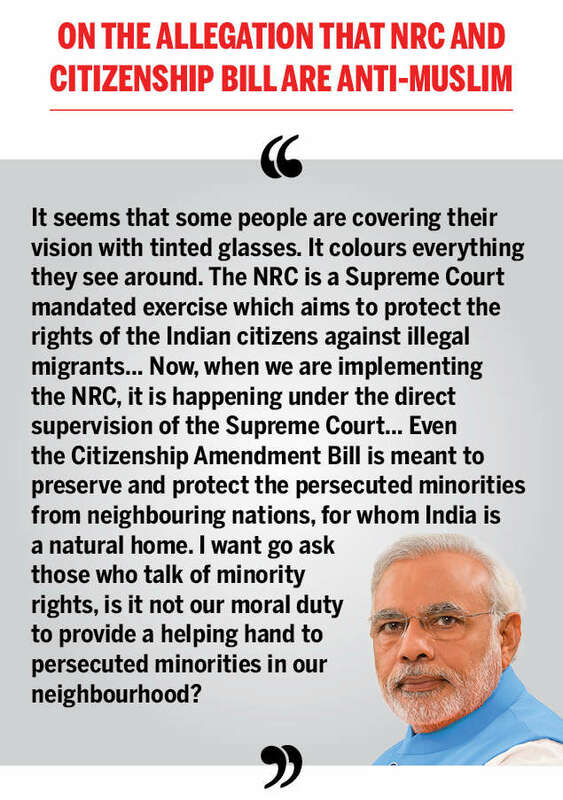 You have strongly raised issues like NRC and Citizenship Amendment Bill, saying these are important for national good. The opposition alleges these are aimed against Muslims. Is this a clash of world views? BJP and Congress manifestos also suggest fundamental ideological differences. Do you feel that differences between BJP and its critics/opposition are irreconcilable? Is there a way to bridge the gap? It seems that some people are covering their vision with tinted glasses. It colours everything they see around. The NRC is a Supreme Court-mandated exercise which aims to protect the rights of the Indian citizens against illegal migrants. The SC had asked the previous government to implement NRC as well but they did not do it. Their government’s typical vote-bank politics came in the way of implementing it. Now, when we are implementing the NRC, it is happening under the direct supervision of the SC. If someone is trying to make unfounded allegations against the NRC process then they seem to consider themselves good enough to question the wisdom of the SC. Even the Citizenship Amendment Bill is meant to preserve and protect persecuted minorities from neighbouring nations, for whom India is their natural home. On humanitarian grounds, it is India’s moral duty to accommodate such people who have no place to go. I want to ask those who talk of minority rights, is it not our moral duty to provide a helping hand to persecuted minorities in our neighbourhood? We are concerned about all minorities who live there… whether Christians, Parsis, Jews, Sikhs, Buddhists or Hindus. The atrocities against these minorities are forcing them to flee to India. This has been the situation since 1947. They have no rights. We will have to come up with a solution. Let me reaffirm that we are doing this with full sensitivity towards the concerns raised by my sisters and brothers of the Northeast. We will always protect their culture, tradition and values. Fortunately, neither me nor the people of India have a coloured vision. People are clear in their minds on putting the nation first. In fact, now they are even clearer when Congress has shed its ‘mukhauta’. The difference between Congress and BJP cannot be more apparent. We stand with the armed forces, they stand with tukde-tukde gang. We stand with Kashmiri Pandits, they stand with those who want two Constitutions and two PMs in the country. We stand to protect and preserve national integrity, they stand to protect those who are guilty of sedition. We stand to ensure quality health to women and children, while it is proven that they loot the money meant for women and children. We stand for democracy, they stand for dynasty, we stand for India First, they stand for Family First. You took up the task of dealing with stalled projects through Pragati. How effective have these interventions been? Is there a way to institutionalise the process so that it does not require the PM to hold meetings himself? There have been 26 Pragati sessions so far and about 230 projects to the tune of Rs 10 lakh crore have been attended to. Projects pending for 34 years have been cleared. Pragati shows when the intent is good and the vision is futuristic, the impossible can become possible – we can achieve great things together. Pragati is now a well-institutionalised system. As for me, I go there with akartavya bhaav, a sense of duty to do as much as I can for the people. Moreover, it is always good to be getting a holistic view of key policy matters from several minds. You built your reputation in Gujarat as someone who didn’t allow himself to be swayed by populism (such as free electricity). But in the last few months, do you feel you had to give in to populist pressures with schemes such as PM-Kisan and promise of pensions to various sections for electoral reasons? Aren’t you charging the most fiscally responsible government in a long time with the tag of populism? In our five years, we have managed to keep a tight leash on fiscal deficit and been extremely responsible with the nation’s finances. This, as you know well, is in stark contrast with the previous government’s performance. 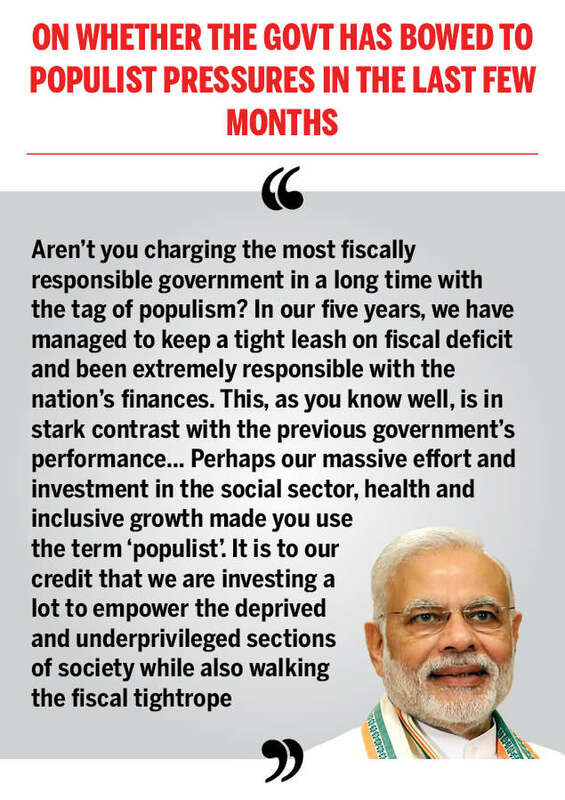 Perhaps our massive effort and investment in the social sector, health and inclusive growth made you use the term ‘populist’. It is to our credit that we are investing a lot to empower the deprived and underprivileged sections of society while also walking the fiscal tightrope. Are loan waivers a means to get rid of poverty? Manmohan Singh ji himself has offered contrary opinion on this before. Both as an economist and as PM. In our roadmap to ensure that farmers’ incomes double by 2022, the welfare of the small and marginal farmers is extremely important. Without improving the conditions of 12 crore such farmers, how can our agriculture sector develop? They need income support to ensure some stability in their lives. On the one hand you have Congress’s approach of promising loan waivers once in 10 years and not even fulfilling that. The outstanding farm debt in 2008-09 when Congress announced its waiver was around Rs 6 lakh crore. They did not even waive debts worth 10% of this outstanding amount, but cheated farmers. Neither did farmers’ debts end nor did their woes. They have repeatedly deceived the farmers in the name of loan waivers and have no intention of doing anything for their long-term welfare. On the other hand, you have our government which is making an effort to transform lives of farmers with reforms at every step of the farming cycle, where PM-Kisan is just one of the measures taken. As for pensions, they are needed to ensure those who are not in the formal setup have a financially secure future. We have targeted these pension plans at those who are often left out of the domain of financial planning. These pension schemes are contributory, with an inexpensive investment coming from the investors. We are incentivising people to invest in their own future. Also, remember, we started these schemes with a specific roadmap in mind with the implementation apparatus ready. This is unlike those who are reacting to our popularity in a knee-jerk manner, announcing things that they are not even clear on how to implement because they don’t intend to implement them anyway. 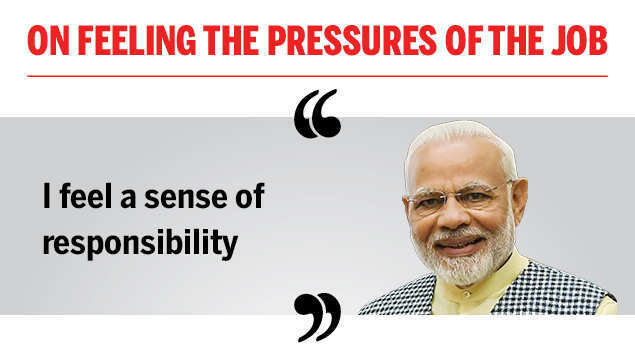 How difficult was it to take the decision to authorise airstrikes on Balakot and, earlier on in your tenure, surgical strikes across the border after the terror attack on the Army camp at Uri? This question is not right. It would have been rather difficult for me, if I hadn’t taken this decision. But let me tell you that these decisions are not taken in the heat of the moment. These decisions are taken after consulting experts, after deliberating on the various pros and cons. When there are no personal or political considerations, when only national interests are supreme and when only deshbhakti guides you, no decision is difficult. How do you react to questions being raised on casualties inflicted in Balakot? Also, the charge of politicisation of armed forces, and that BJP is using Pulwama and Balakot for political gain? We have full trust in the valour of our armed forces. As for those doubting it, people of India will give them a fitting answer. Who are the people claiming politicisation of the armed forces? These are the same people who took credit for victory in the 1971 war. These are the same people who took credit for the launch of Aryabhatta satellite. These are the same people who made up a fake scam of ‘army coffins’ during Vajpayee ji’s government. Was all this not politicisation? 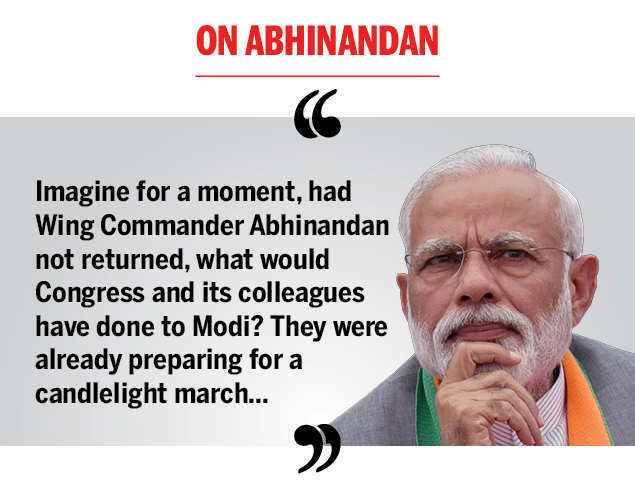 Imagine for a moment, had Wing Commander Abhinandan not returned, what would Congress and its colleagues have done to Modi? They were already preparing for a candlelight march. Even so-called neutral people of this country, who stayed silent after 26/11, would not have spared Modi if no action was taken after Uri & Pulawama. Sena desh ki hai, parakram bhi desh ka hai, aur chunaav bhi desh ka hai. Imran Khan has reportedly said it would be easier to negotiate a settlement with a BJP government as you have the leeway to take bold decisions which others lack. 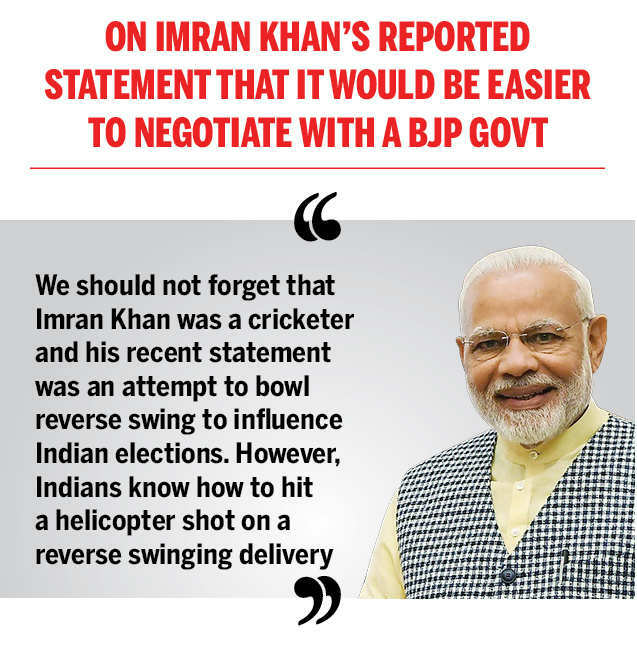 We should not forget that Imran Khan was a cricketer and his recent statement was an attempt at reverse swing to influence Indian elections. However, Indians know how to hit a helicopter shot on a reverse swinging delivery. 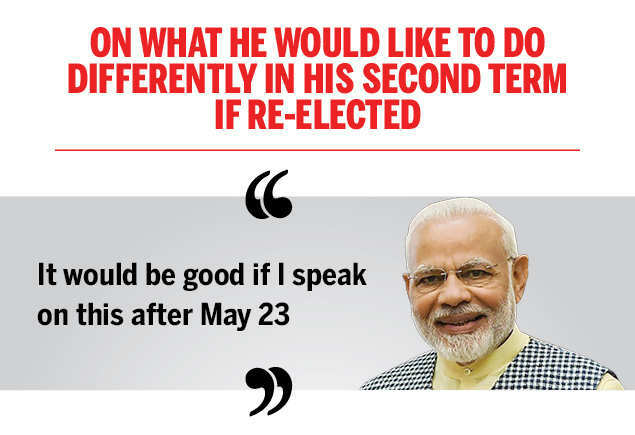 We should also remember how he used Modi’s name during Pakistan elections. His slogan was: ‘Modi ka jo yaar hai, who gaddar hai, woh gaddar hai’. What is the way ahead for GST? Have concerns of traders, especially the smaller ones, been adequately addressed? For a nation of 130 crore people and so many states to completely transform its economy so smoothly is a great achievement. To move from multitudes of different central and state taxes to just one tax is not simple but we have done it successfully. GST has been evolving towards lower taxes. Already, 99% of items for the common people are now taxed on an average at half the pre-GST tax rate. Tax rates came down on over 80 household goods and many daily-use items attract no tax at all. Burden of taxes will keep reducing with GST. This is because GST has brought in ease of compliance for all, given that it is an online platform-based system with greater transparency. This has boosted ease of doing business. Throughout the GST implementation process, we have been very sensitive to concerns of the business community, especially small traders. We have heard them out, incorporated their suggestions, ensured their concerns are addressed. Exemptions from GST for small businesses have been doubled from Rs 20 lakh to Rs 40 lakh. Small businesses with a turnover up to Rs 1.5 crore have a composition scheme where they pay a flat rate and file only one annual return. Farmers in several parts of the country appear to be unhappy because of unremunerative returns on their investment. How do you propose to strike a balance between their interests and those of consumers, who are reaping the benefits of low food inflation which, in turn, results in poor income growth for farmers? Farmers’ welfare is a key priority for us and we have been working on it from day one. We have a stated aim of doubling farmers’ income by 2022. We haven’t spoken in vague terms but have been specific so as to assure and ensure accountability. Be it sowing or selling insurance or irrigation, reforms have been seen across the agriculture sector. We are augmenting our farmers’ sources of income and reducing the risks they face. Focusing at both ends of the agricultural cycle, we worked to decrease the input costs while ensuring proper prices for the produce. There are middlemen between farmers and consumers. If you think of that, you will understand the problem. That’s why we are giving the farmer an assured income. To ensure that farmers’ income growth does not suffer, we declared MSP hikes that fixed the MSP at a minimum of 1.5 times the cost. Now, it is not enough to announce MSP hikes. We have to buy more from the farmers at MSP to ensure the hike actually benefits them. This is where you see the stark difference between the earlier government and ours. Let me give you just one example. During the five years from 2009-10 to 2013-14, under UPA, only around 7 lakh MT of pulses and oilseeds worth Rs 3,117 crore were procured at MSP. During 2014-15 to 2018-19, under NDA, 94 lakh MT of pulses and oilseeds worth Rs 44,142 crore were procured at MSP by the government. This is more than a ten-fold increase. 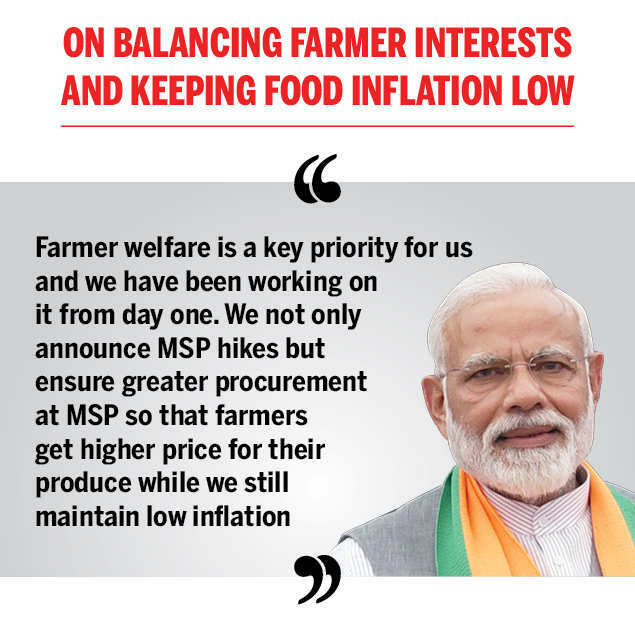 So, we not only announced MSP hikes but also ensured greater procurement at MSP so that farmers got higher price for their produce while we still maintained a low inflation. As opposed to those whose promises remained confined to expired manifestos even when they had 10 years to do it, we brought in direct income support within a month of announcing it. This will benefit 12 crore small and marginal farmers, put money into their hands and also boost rural consumption. Remember, we don’t just announce schemes, we implement them too. Crores of farmers have already received the first instalment directly in their bank accounts. Contrast this with the situation in Congress-ruled states where waivers were promised, but instead of waivers, farmers are receiving arrest warrants! In our manifesto, we have declared that we will extend PM-Kisan to all farmers. These are all ways to augment farmer incomes. For agriculture and rural development, we have promised to spend Rs 25 lakh crore in the next five years. On a scale of 10, how would you rate your government’s performance? 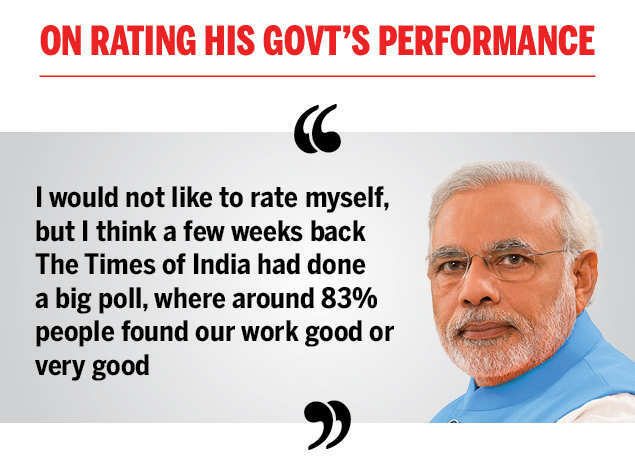 I would not like to rate myself, but I think a few weeks back The Times of India had done a big poll, where around 83% people found our work good or very good. BJP has changed about one-third of its sitting MPs for various reasons, including performance. Are you happy with the performance of all your ministers, or will you change some of them? With the BJP president contesting LS elections, is this a signal that he’ll be brought into government? 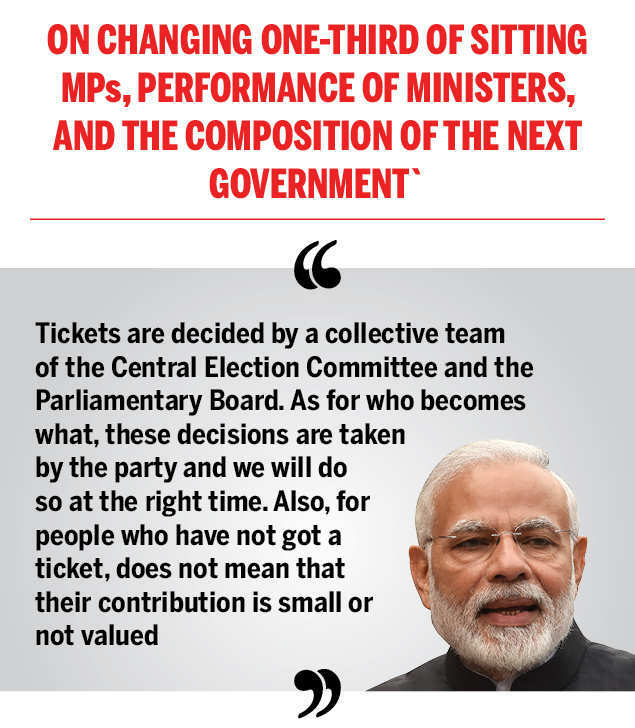 Tickets are decided by a collective team of the Central Election Committee and the Parliamentary Board. As for who becomes what, these decisions are taken by the party and we will do so at the right time. Also, for people who have not got tickets, this does not mean their contribution is small or not valued. You have said that the Gandhis will never come back to power. But it is also said that in politics, you can never write off a politician. What do you think is the key difference between now and 2004 when the NDA was widely expected to return to power but didn’t? I am not someone who lives in the past. Today, there is a unanimous view that in 2004 elections, a party, alliance or candidate did not lose, it was India that lost. During the tenure of Atal ji’s government, the nation got a new spirit of hope. It was believed that India’s development aspirations will be met and that we were ready for the 21st century. All that changed in May 2004. Congress and UPA took us backward. There was an era of stagnation and corruption. This time, there is lot of enthusiasm and a positive vote for NDA. Your tenure has been free of scams. But the opposition has attacked you for the escape of Vijay Mallya and Nirav Modi. The controversy over Rafale persists. The Supreme Court recently agreed to hear the challenge to their verdict giving the government a clean chit in the deal. There is no controversy over Rafale. They went to the Supreme Court and look what happened. They went to the CAG and look what happened. But for a section of media, admission of a few documents is a ‘Blow to Modi’. The same section of media does not create a controversy over Supreme Court’s notice for distorting its verdict. The same section of media does not give ‘Blow to XYZ’ headlines on the ‘Tughlaq Road Chunav Ghotala’. The same section of media does not give ‘Blow to XYZ’ headlines on the revelations in Agusta Westland. The same section of media does not give ‘Blow to XYZ’ headlines on the court’s verdict on National Herald. As for absconders, do not forget that it is also our government that got Christian Michel, Rajiv Saxena and Deepak Talwar back. I would like to again state that anyone who has looted the nation will not be spared. What has given you the greatest joy and satisfaction in the last five years? This is a responsibility, not a game of joy… It is the misfortune of the nation that previously many people could not use such a big post for the common man. Some of the work that I’ve had to do should have been done long ago. In 2014, there was total despair. Today, the country is filled with aspiration. To create such a sentiment among 130 crore citizens in such a short time is a matter of happiness for me. You’ve spoken of an aspirational society. How do you address these expectations? I am addressing (expectations) continuously for the past five years. Had I done nothing for five years, who would have any expectations from me? No one would. People have seen the previous 10 years. Is there anything you’d like to do differently in the next five years, if re-elected, from what you did in these five years? It would be good if I speak on this after May 23. Lok Sabha Election 2019 Phase 3 LIVE: Voting in phase 3 of the Lok Sabha Election 2019 is underway in 116 parliamentary constituencies, including all constituencies in Gujarat and Kerala. BJP president Amit Shah, Congress chief Rahul Gandhi and several Union ministers among prominent candidates are in the fray in phase 3 of the Lok Sabha election 2019. Besides all seats in Gujarat (26) and Kerala (20), voting will be held in four seats in Assam, five in Bihar, seven in Chhattisgarh, 14 each in Karnataka and Maharashtra, six in Odisha, 10 in Uttar Pradesh, five in West Bengal, two in Goa, and one each in Dadra and Nagar Haveli, Daman and Diu and Tripura. The polling in Tripura East constituency, which was earlier scheduled for April 18, will be held in this phase, as also in a part of the Anantnag Lok Sabha seat in Jammu and Kashmir, where election is being held in three phases. In the first two phases, election was held on April 11 and April 18. Prime Minister Narendra Modi arrives to cast his vote at a polling booth in Nishan Higher Secondary School in Ranip, Ahmedabad; BJP President Amit Shah will also cast his vote at the same polling booth. Voting began Tuesday on a dull note in Anantnag district of Anantnag Lok Sabha constituency, where polling will be held in three legs, amidst tight security measures, officials said. Residents in most parts of the district in restive south Kashmir have stayed indoors so far, an official said. The Election Commission has curtailed the polling duration for Anantnag Lok Sabha constituency by two hours following a request from the state police to this effect. The voting will be held in south Kashmir areas from 7 am to 4 pm. The Anantnag district has 5,29,256 electors including 2,69,603 males, 2,57,540 females, 2,102 service electors and 11 transgender voters. The voting in the phase 3 of the Lok Sabha election 2019 has finally begun in all the three booths of Kerala’s Annapara. There was a 40-minute delay after glitches were reported in some Electronic Voting Machines (EVMs). Prime Minister Narendra Modi met his mother at her residence in Gandhinagar today. He will cast his vote in Ahmedabad, shortly. Prime Minister Narendra Modi meets people outside his mother’s residence in Gandhinagar. He will cast his vote in Ahmedabad, shortly. BJP President and party’s candidate from Gandhinagar Parliamentary constituency Amit Shah, near the polling booth at Nishan Higher Secondary School in Ranip, Ahmedabad. Some attempts have been made to capture a booth in ward number 7 of the Domkol municipality in West Bengal’s Murshidabad. Three Trinamool workers are said to have injured in the clashes. More details are awaited in the case. Visuals from polling booth number 151 in Supaul parliamentary constituency in Bihar where voting is yet to begin, currently mock poll is underway at the polling booth after a faulty EVM was replaced. The voting at Annapara polling booth in Kerala’s Pathanamthitta is yet to begin due to Electronic Voting machine (EVM) glitches. EVMs at only two of the three polling booths are currently functioning. EVM testing is on the third EVM is underway. Only one of the EVMs at the polling booth in Annapara is working. Mehbooba Muftis popularity in her traditional family stronghold Anantnag will be on a test when the Lok Sabha constituency goes to polls in three phases on April 23, 29 and May 6. Mufti, who was elected to the Lok Sabha from this constituency in 2014, is being challenged by state Congress chief G.A. Mir and former judge of Jammu and Kashmir High Court Justice Hasnain Masoodi of the National Conference. Prime Minister Narendra Modi has arrived at his mother’s residence in Gandhinagar, Gujarat. He will cast his vote in Ahmedabad, shortly. Gujarat: Prime Minister Narendra Modi arrives at his mother’s residence in Gandhinagar. He will cast his vote in Ahmedabad, shortly. The voting in phase 3 of the Lok Sabha election in Kerala has begun but minor glitches have been reported at some polling booths. EVM glitches have been reported at some polling booths in Thiruvananthapuram. The polling in this Lok Sabha constituency is yet to begin. Visuals outside a polling booth in Assam. Voting has begun for Phase 3 of the Lok Sabha Elections has started. Prime Minister Narendra Modi will cast his vote in Gandhinagar constituency. Prime Minister Narendra Modi urged people to cast their vote in Phase 3 of the Lok Sabha elections. Urging all those voting in today’s Third Phase of the 2019 Lok Sabha elections to do so in record numbers. Your vote is precious and will shape the direction our nation takes in the years to come. I’ll be voting in Ahmedabad in a short while from now. Visuals of preparation from polling booth number 162 in Sayajigunj of Vadodara. Voting for the third phase of elections begins at 7am today. Residents of Laharu Teeka village of Naura panchayat have said that they decided to boycott elections. Everyone asks for votes but no one does anything for construction of roads. We’ll boycott elections until roads are built,” say villagers. Kartar Singh, local: We’ve to carry patients & pregnant women till the main road, on a cot. We had complained to the current as well as previous MLA but to no avail. Everyone asks for our votes but no one does anything for our roads. They make promises at the time of elections. Visuals from polling booths 17, 18, 19 and 42 in Kochi, ahead of the third phase of elections. Kerala: Visuals from polling booths 17, 18, 19 and 42 in Kochi, ahead of the third phase of elections. Voting begins at 7 AM today. The states that would be voting in phase III of the Lok Sabha election 2019 are: Assam (4 parliamentary constituencies), Bihar (5), Chhattisgarh (7), Gujarat (26), Goa (2), Jammu and Kashmir (1), Karnataka (14), Kerala (20), Maharashtra (14), Odisha (6), UP (10), West Bengal (5), Dadra and Nagar Haveli (1) and Daman and Diu (1). The third phase of the seven-phased Lok Sabha elections 2019 will take place on April 23 to choose 116 members of Lok Sabha across 14 states. DIU (Data Intelligence Unit), a data unit of India today has identified 33 seats as stronghold seats. Six parties have, so far, held these seats for three or more consecutive Lok Sabha elections. These seats have been considered as the safest seat” for the respective parties. But some of them look wobbly in 2019. Polling will be held on Tuesday for the third and largest phase of Lok Sabha election in 116 seats, including all constituencies in Gujarat and Kerala, with BJP president Amit Shah, Congress chief Rahul Gandhi and several Union ministers among prominent candidates in the fray. Apple has been producing older models of iPhones in Bengaluru for many years, but it will now expand its manufacturing to the newest models. Apple’s iPhones will be mass produced in India by Foxconn Technology from this year onwards, marking a shift of the company’s production from China, Bloomberg reported. Terry Gou, the group Chairman of the Taiwanese manufacturing company, said Prime Minister Narendra Modi invited him to India. Apple has been producing older models of iPhones in Bengaluru for many years, but it will now expand its manufacturing to the newest models. It was reported earlier this month that Foxconn will start trials of producing iPhone X and iPhone 7 in India before launching a full-scale assembly in its factory in Chennai. India’s smartphone market is the fastest-growing in the world, leaving behind a stagnated China. Due to Chinese competitors like Xiaomi offering advanced features at lower prices, Apple is losing its market share in the country. It hopes to ramp up its sales in India by manufacturing locally which would let it dodge the 20 percent import duties. It is unclear how Apple’s foray into manufacturing in India will affect its relationship with China, which has been its production hub for years with Foxconn and other partner companies. There are two assembly sites of Foxconn in Andhra Pradesh and Tamil Nadu, where it also manufactures Xiaomi and Nokia devices. As the US and China engage in a trade battle, it might be helpful for Apple and Foxconn to find a third market to focus on. Sources told the wire agency that Foxconn’s Indian assembly line, Hon Hai Precision Industry Co, would serve local and export markets before Apple’s new iPhone models in September. Foxconn’s initial investment will be about $300 million to set up, with lined-up investments depending on capacity expansion. The ruling party promised pension for small and medium farmers and shopkeepers, days after the Congress vowed to bring about several welfare measures, including a grant of Rs 72,000 to the poorest 20% households in the country, if voted to power. rime Minister Narendra Modi and Union Home Minister Rajnath Singh during the release of Bharatiya Janata (BJP) party’s manifesto for Lok Sabha elections 2019, in New Delhi, Monday, April 08, 2019. Releasing the BJP Sankalp Patra, or manifesto, for Lok Sabha elections 2019 on Monday, Prime Minister Narendra Modi said the government was moving ahead with ‘one mission and one direction. He said the development had to be flexible to suit the country’s diversity, it had to be multi-layered and multi-directional. The party manifesto charted 75 milestones India @75 had to achieve, chief focus being on the farm sector, education, health and infrastructure. BJP released the party manifesto for Lok Sabha elections 2019. Others present at the function were ministers Sushma Swaraj, Arun Jaitley, Rajnath Singh and other senior leaders. Members of the BJP’s parliamentary board, its apex body, Prime Minister Narendra Modi and its chief Amit Shah were present at the launch of the manifesto in New Delhi. Senior BJP leader Arun Jaitley had on Sunday unveiled campaign themes and other materials of the party’s election campaign. The party has chosen the slogan “Phir ek baar Modi sarkar” as its election tagline and its campaign will revolve around the Narendra Modi-led government’s achievements in the past five years. And the Congress, on its part, has adopted the official campaign tagline of “Ab Hoga NYAY”, centred around its minimum income guarantee scheme and party president Rahul Gandhi. The BJP crowdsourced its manifesto and held events across the country to get inputs from different sets of voters like farmers, youths, women, businessmen and others. Union home minister Rajnath Singh-led manifesto committee of the BJP had decided to form 15 sub-panels to reach out to the different group of voters in January this year. The 20-member Manifesto Committee includes Union ministers Arun Jaitley, Ravi Shankar Prasad, Nirmala Sitharaman, Thaawarchand Gehlot, Piyush Goyal, and Mukhtar Abbas Naqvi. It also has former Madhya Pradesh chief minister Shivraj Singh Chouhan, Bihar’s deputy chief minister Sushil Modi, his Uttar Pradesh counterpart, Keshav Prasad Maurya, among its members. Polling will be held in seven phases across the country from April 11 to May 19. The results will be declared on May 23. Finance Minister Arun Jaitley on Friday issued a blog post based on the sensational revelations in the ED’s supplementary chargesheet in the Agusta Westland scam which has been accessed by Republic TV. The 52-page chargesheet contains explosive mentions on virtually every page and also provides answers to key questions that have been raised in the case from years earlier. It is on some of these questions, particularly regarding certain abbreviations and whom they refer to, that Jaitley has written his post. Who are ‘RG’, ‘AP’ and ‘FAM’? Rahul Gandhi talks on several subjects with which he does not even have a nodding acquaintance. He makes wild and unsubstantiated allegations against all and sundry. The only subject he refused to speak about or respond is the one on which he alone knows the truth – his own accounts. When reports have indicated that his own personal ‘capital creation’ programme was on the strength of ‘Sweetheart Deals’ with ‘fly-by-night operators’, he imposed censorship on himself and also on otherwise an outspoken Media Cell of the Congress Party. been given. Silence in this case speaks more than any fake explanation. The chargesheet in the AugustaWestland case has clearly mentioned that in the documents which were recovered by the Swiss Police from the house of the mother of Guido Haschke in Lugano, Switzerland, carried a reference in the English alphabets which identifies the name of certain political leaders/ entities who had influence with the UPA Government. It is relevant that when the Chairman and CEO of AugustaWestland was arrested in February, 2013 in Italy the CBI had registered the initial PE in 2013 itself. It is only after the Government of India succeeded in getting Christian James Michel on 4th December, 2018 and Rajiv Saxena on 30th January, 2019 that investigations made a significant headway. The chargesheet is based on oral and documentary evidence. To whom is the reference of ‘RG’, ‘AP’ and ‘FAM’ being made? Investigators have quoted in the chargesheet the statements of the concerned persons. The documents recovered in Italy corroborate with the oral and documentary evidence collected in India. There is an erroneous belief among Indian politicians that a diary, as in the Jain Hawala Case, is never admissible as an evidence. A diary constitutes an admission in writing and is admissible against the maker of that admission. It is admissible against the other co-conspirators if it is made when the conspiracy was still being executed and there is other evidence that corroborates the contents of the diary. That is the law laid down by the Privy Council in ‘Mirza Akbar’s’ case and has held grounds throughout. In the Jain’s case, there was no corroboration of the Diary. This legal argument is, however, relevant for the purposes of the legal case. Arguments of probity in the public space demand more answers. Are ‘RG’, ‘AP’ and ‘FAM’ fictional characters or were they in a position to influence the deal? How come every time there is a controversial defence deal and evidence is collected, names close to the Congress Party’s first family start appearing? When the alphabet ‘Q’ appeared in Martin Ardbo’s diary in the Bofors Case with a comment that ‘Q’ must be protected at all cost, the Party was in denial even then. It is only when the Swiss authorities in 1993 disclosed the names of one of the beneficiaries of the kickbacks of Bofors being paid as Ottavio Quattrocchi, the Narasimha Rao Government facilitated his escape from India in less than 24 hours. This did not wash away the ghost of ‘Q’ which had scarred the face of the Congress Party nor will ‘RG’, ‘AP’ and ‘FAM’. Public neither forgets nor forgives the corrupt. Silence is never an answer to documentary evidence of corruption. The Right to Silence is available to an accused, not to a Prime Ministerial aspirant. Prime Minister Narendra Modi on Sunday will interact with people who have pledged their support to the Main Bhi Chowkidar campaign from New Delhi’s Talkatora stadium. During the session, BJP top brass will be present in the event. On March 24, the BJP started registrations for the programme. He had tweeted about “an invigorating interaction with lakhs of Chowkidars from over 500 locations across the length and breadth of India” and even urged people to order ‘Main Bhi Chowkidar’ merchandise. ‘Mission Shakti’ is being viewed through the election lens. It has nothing to do with that. It is a big win for our scientists. Before this, only three nations had accomplished this feat: PM Modi. Our principle has been to reward honesty. From the very first day, we ensured that honest taxpayers do not face any difficulty. I promise to the countrymen that those involved in scams, would be punished: PM Modi. PM Narendra Modi takes a dig at Vijay Mallya over his ‘bad jail condition’ excuse to avoid extradition. Taxpayers should be respected: PM Modi. Those who have looted exchequers money will not be spared: PM Modi. Since 2014, I have taken them to the doorsteps of jail. Some are out on bail, some are waiting for dates: PM Modi. I will not tolerate corruption, that’s my commitment: PM Modi. I left Balakot airstrike decision to the forces as I believe in their discipline: PM Modi. The worry for Pakistan, when such strikes take place, is not that terrorist camps get destroyed. The worry is that it proves that the camps exist: PM Modi. The main reason why Pakistan is not accepting Balakot attack because after that they will also have to accept that terrorist camps were active there: PM Modi. From now, it will be there (terrorists) land and our game: PM Modi. My forces will never let the country down, I have full faith in their discipline: PM Modi. I have full faith in my forces: PM Modi. Full majority mandate plays a pivotal role in a democratic set-up: PM Modi. It’s not me but the forces who have implemented Balakot attack: PM Modi. ‘Chowkidar isn’t about a uniform, nor is it about being tied to a spot. It’s a spirit’, says PM Modi addressing the mega ‘Main Bhi Chowkidar’ townhall in New Delhi. The populace of the country doesn’t need Rajas and Maharajas. This is why I’m happy that the feeling of chowkidar is expanding within me. I bow down to those who have joined this movement, this feeling of chowkidar: PM Modi. #ElectionsWithNewsNation | I convey my greetings to all the ‘Chowkidars’ across the nation who have joined today’s programme: PM @narendramodi at New Delhi’s Talkatora Stadium. In 2013-14, during the Lok Sabha Elections, I was somewhat known as CM but was new to the nation. I assured people that they are placing a chowkidar for the responsibility they are giving me: PM Modi. We are all Chowkidars, committed to a strong & prosperous India: PM Modi. Critics made me popular. People barely knew me before 2014: PM Modi. Back in 2014, I assured people that as a chowkidar, I will do fulfill my duties: PM Modi. I thank the people who have criticised me. Its because of them I got so much of popularity back in 2014: PM Modi. PM Modi begins his address. BJP top leaders in attendance. PM Modi reaches New Delhi’s Talkatora stadium. Attacking the Congress, Modi said the grand old party is “synonymous with corruption” and has the habit to take people of the country for a ride. Prime Minister Narendra Modi on Saturday asked the people of Arunachal Pradesh to vote for a ‘chowkidaar’ who would provide security to the country even as he attacked Opposition parties, saying they were “disheartened” by India’s growth and success. Kicking off his campaign here for simultaneous Lok Sabha and Assembly polls in Arunachal, the prime minister said Arunachal is a “shield for the country with the people zealously guarding the border as sentinels”. “Whenever the country makes achievements, don’t you feel happy? Everyone, irrespective of their social and financial status, regales at India’s success stories. There are, however, some who feel disheartened by India’s growth and success,” the PM said. “When India hit terrorists in their houses, what was the stand of opposition parties, you have all seen. Even when our scientists made achievements, they found excuses to belittle them,” the PM said, urging the people to “punish” opposition parties in the upcoming elections. He also thanked the people of the state for voting the double-engine government of the BJP to power at the Centre and the state. “In the northeast, the lotus first bloomed in Arunachal. It is because of your support, the Centre has been able to bring about development in the state,” he said. Listing his government’s achievements, the PM said the Centre has provided power connection to 50,000 families, gas connection to 40,000 mothers and sisters and built toilets for over 1 lakh families in the last five years. Referring to the Arun Prabha channel, launched recently, the PM said it will ensure that people across the country get to learn about Arunachal, its people, culture and festivals. “Arunachal, which is set to hold Mopin festival soon, will be able to tell the world about its festival and culture through the recently launched Arun Prabha channel,” he stated. Election to Lok Sabha and Assembly will be held on April 11.